Today’s Hajj pilgrims will experience unprecedented comfort compared to those of even just 20 years ago. In the last decade the Saudi government has pumped billions of dollars into providing modernized services and amenities to accommodate the millions of Muslims who make the annual pilgrimage. But the spirit of Hajj itself remains unchanged, said Rashid Mogradia, CEO of the Council of British Hajjis (CBH). 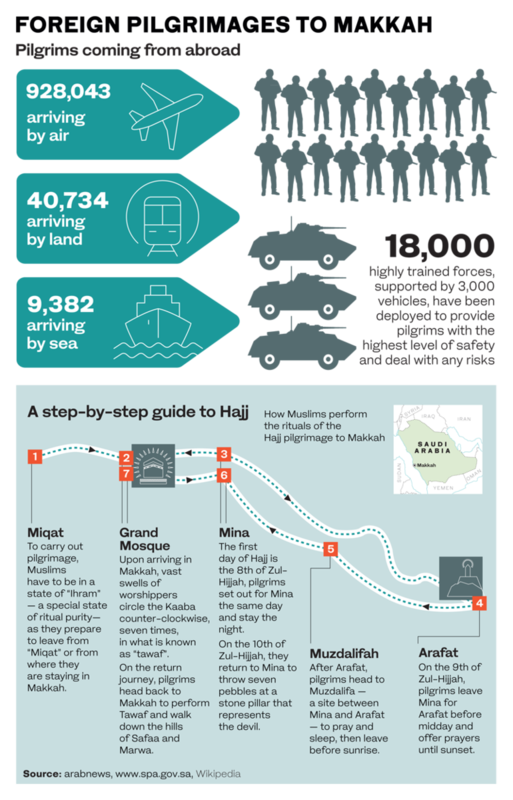 “Everything about getting to and staying around Makkah is easier now, thanks to streamlined systems and electronic processing, but the five days of Hajj are the essence of the journey and remain authentic,” Mogradia told Arab News. Mogradia, who has completed the Hajj journey five times himself, will join around 25,000 fellow Brits this year as he once again travels to Makkah for the ultimate spiritual journey. “When you’re in the barren desert and wearing nothing but two pieces of cloth, you leave the creature comforts behind. This is the real Hajj experience. It is ever challenging and spiritual,” he said. As the Hajj consists of a series of physically demanding rituals, pilgrims have to be in their best physical condition. Conducted over five days, it includes rigorous exercises such as the circular, counter-clockwise procession around the Kaaba, and the symbolic stoning of evil. Zohra Sarwari, a California-based Muslim author and coach, recommends walking long distances before the Hajj. “You should walk at least two to five miles a day,” she said. Although she managed to walk “most of the way” from Makkah to Mina and back, she admitted: “Let’s just say I wanted a wheelchair due to the difficulty of it all,” she said. The international life and business coach also recommends “doing cardio and being in shape” because this will make the Hajj experience easier and more relaxing. “It is a journey into self-reflection and personality development. It’s an experience that allows Hajjis to live the brotherhood and sisterhood of humanity. It is a journey for learning the art of sacrifice; it allows pilgrims to connect with the divine,” he said. The coach said pilgrims should read books and watch videos to learn about the process of Hajj beforehand. “This is so they understand what each step means, so that they know how to perform them and appreciate why we do them,” she explained. Sarwari also said it is important to ask people about their experiences to get their thoughts on what to do and what to avoid during the trip. The coach added that pilgrims should “clarify their intentions” before embarking on the Hajj. “Personally, I didn’t use the phone except to let my dad know that we got there safely. I wasn’t there to talk on the phone, or record everything. I was there to connect to my Lord,” Sarwari said. Mogradia said Hajj pilgrims have a “moral obligation” to bring the experience back with them and share it with their community — Muslims and non-Muslims alike. “Hajj (pilgrims) are guests of God and they should bring that experience back to the community. The Hajj experience shows that people from all corners of the world can actually get along,” said Mogradia.